Library services in Royalton were originally provided by the Royalton Academy, which was established in 1807, and by a small library association that was formed after the Civil War. In 1893, the Vermont legislature passed a law providing state aid for towns that elected trustees and appropriated money toward a town library, which Royalton managed to accomplish by 1896. The Royalton Free Public Library actually came into existence in 1898, with the collection housed in a small brick building (formerly a bank) in Royalton village. Royalton village had roots back to the 1780s, but by the early 1900s growth in the town was centered a few miles to the south in South Royalton village. In 1893, a new grade school opened in South Royalton and by 1900 South Royalton’s population had grown to nearly three times that of Royalton village’s. 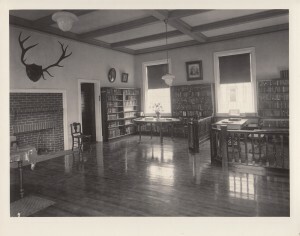 In 1909, Reverend Joel F. Whitney campaigned to expand the library, purchase books, prepare a catalog, and open an additional branch so that there would be a branch in both of the town’s villages. In 1912, Evelyn Lovejoy was elected to the board of library trustees, becoming the first woman elected to public office in Royalton. In 1917, the library committee merged with the historical association to form the Royalton Memorial Library Association, which proposed to raise money to build a new, permanent library building. The association, which by this time was comprised in the majority by residents of South Royalton, voted unanimously to purchase the current library site at the corner of Stafford Street and Alexander Place, one block from South Royalton’s village green. Construction began in 1919 and by 1921 the frame exterior was nearly complete, but the money raised by pledges had run out. Evelyn Lovejoy canvassed the town soliciting additional contributions on behalf of the association. 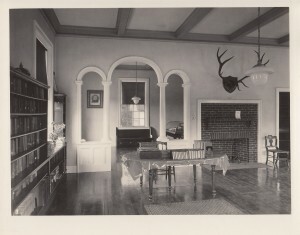 The Royalton Memorial Library was dedicated during Old Home Week in August 1923, with the library occupying the second floor of the small Georgian Revival style brick building along with displays belonging to the historical society. In 1957, residents converted the unfinished basement into the town clerk’s office. In 1971, the library association sold the building to the town for one dollar. In 1976, the core of South Royalton village, including the library building, was entered in the National Register of Historic Places. In 1997, the branch library in Royalton village closed due to lack of use; funds and its collection were consolidated into the South Royalton building. Currently the town offices are researching alternative quarters and the Royalton Memorial Library plans to renovate the existing building to meet needs for additional space and handicap accessibility.